“What a Loving and Beautiful World’’ is an interactive multimedia installation at the Radcliffe Institute. CAMBRIDGE — Thanks to its many innovative research institutions and to the long-term contributions of organizations like Boston CyberArts, this city is a great place to see interactive, projection-based art. October has been especially rich for this kind of work. The second annual Illuminus festival — a spectacular laser and light show organized by Jeff Granz — was held on Lansdowne Street, as part of HUBweek, on the night of Oct. 10. A week later, Joseph Ketner of Emerson College organized “Electric Pilgrims,” a group show featuring outdoor projections on building facades and TV screens set up on Channel Center Street in South Boston. Both events had to contend with the weather and were limited to one night. 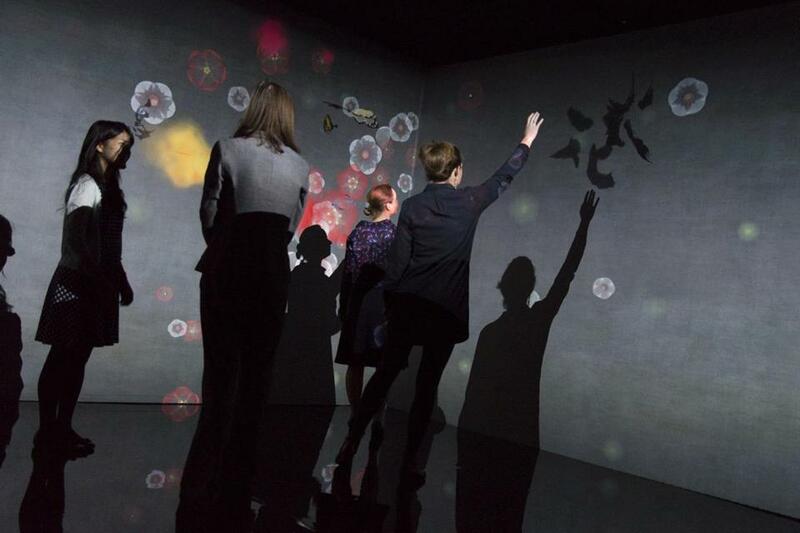 That’s not the case with “Parallax,” Shahzia Sikander’s ravishing animated projection at Tufts University Art Gallery, which I reviewed a few weeks ago. Nor is it the case with a new show at Harvard’s Radcliffe Institute. Both are indoors, and ongoing. Called “What a Loving and Beautiful World,” the Radcliffe show is in the new Johnson-Kulukundis Family Gallery in Byerly Hall. It is immersive, interactive, and genuinely entrancing. It’s by teamLab, a large consortium of artists, programmers, engineers, computer graphics animators, mathematicians, and graphic designers, formed in 2001 and based in Tokyo. There are three parts to teamLab’s display at the Radcliffe Institute (which, by the way, has an impressively ambitious art program). The biggest and most memorable is a video installation in a room you walk into, and then have a hard time leaving — it’s that engrossing. Calligraphic characters, in both Japanese and Chinese script, descend slowly from the low ceiling. Reach out toward them and they shrink away, before transforming into the thing they connote. The character for “mountains,” for instance, turns into animated imagery of a mountain range; the same for snow, rain, and so on. The biggest and most interactive portion of the show surrounds visitors. The imagery, traditional in appearance (which is to say painted with brush and ink), spreads magically and seemingly spontaneously across the gallery’s three walls. Bare winter branches alternate with birds in flight, butterflies, and floating flower petals. A rainbow appears, then slanting rain, then snow — or the same, but in a different order. Dark, inky effusions contrast with a splendidly isolated moon, a sun, mountains and waves, a blue dawn, an enflamed sunset. The writing was executed by a professional calligrapher who goes by the name Sisyu. The work’s conception is attributed to her and to teamLab. The accompanying soundtrack, the kind of atmospheric but essentially flavorless music you hear while getting a back massage, is by Hideaki Takahashi. It’s hard to explain how charming and at times transporting the work is. The interactive conceit — your awareness that the imagery is responding to the willed movements of your and your fellow viewers’ arms — is tempered by a wondrous sense of words and pictures appearing and spreading in ways beyond your control. You lift your arm to make something happen, but a second later, some other image swells across the screen as a result of someone else’s actions. The whole thing feels likably democratic. Yet compositionally, the visuals never feel crowded or chaotic. 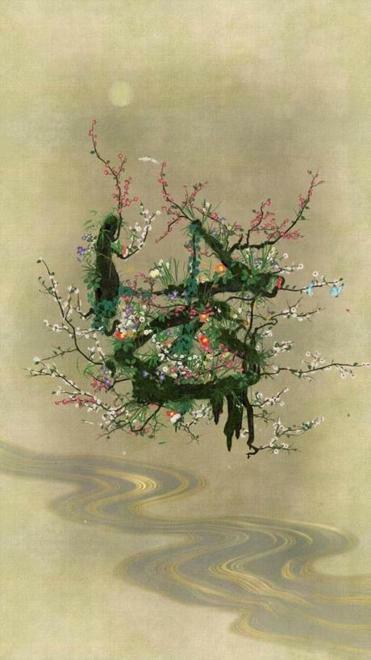 As in traditional Asian art, there is a beautiful tension between emptiness and fullness, and between elements that splinter and those that cohere. An image from “Life Survives by the Power of Life,” a digital animation outside the main gallery. Outside this main gallery are wall-mounted screens showing two more works, both featuring calligraphy by Sisyu, animated and ornamented by her teamLab colleagues. One called “Life Survives by the Power of Life” is a six-minute digital animation that begins, hypnotically, with pooling black ink marks appearing out of nowhere on a light, inchoate ground. The second, “Cold Life,” began as a kind of peeling away of the virtual surface of the previous work, so that we see its computer graphics “bones,” so to speak: wireframe models with dense abstracted data rendered in three dimensions, in a dominant palette of electric blue. 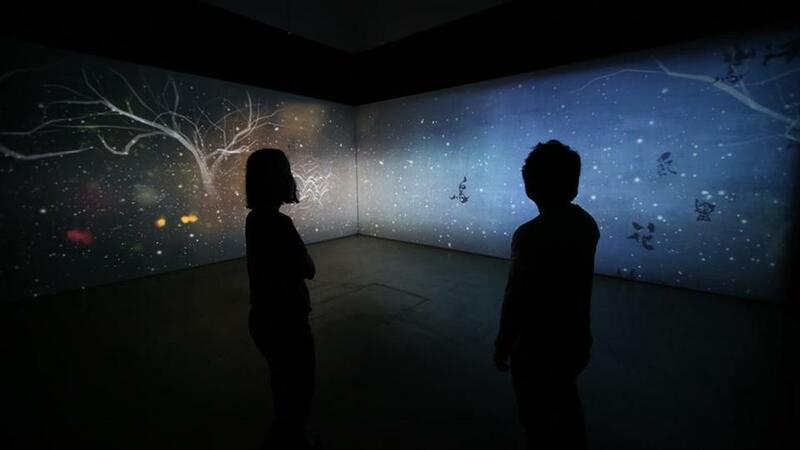 The imagery in all three teamLab works feels clichéd and sentimental, while its stated themes — nature and humanity — are perhaps unhelpfully vague. But somehow, the mash-up of traditional and new, handmade and high tech, pulls you in, and you succumb to these works’ inner logic. Bring kids, if you can. They will love it.